The recent case of Abdul Rahman, an Afghan who converted to Christianity and was sentenced to death for doing so, has made Islamists in the West squirm. The Shari'a is perfectly clear and unanimous about the need to execute Muslims who leave their faith, whether becoming atheists or converts to another religion. If a tutorial in the matter were needed, the Rushdie affair of 1989 provided an ample one. But it's not possible to acknowledge this fact to Westerners who, as one, condemn such intolerance. The apostasy controversy highlights the importance of allowing Islamic reformers more say in public debate about political and legal reforms, and demonstrates the extent to which world powers undercut cultural and religious reforms by backing autocratic regimes the crack down on Muslim reformers in the name of combating political Islam. To legitimize their political rule and enlist the support of religious voices, autocratic rulers often align themselves with traditional religious scholars, who embrace a literalist understanding of shari'ah and perpetuate rigid and anti-reform agenda in Muslim societies. Apr. 6, 2006 update: For an in-depth analysis of tawdry, dishonest apologetics on this subject, see Robert Spencer's excoriation of a article in the Chicago Tribune by M. Cherif Bassiouni, professor of law at DePaul University and president of the International Human Rights Law Institute. 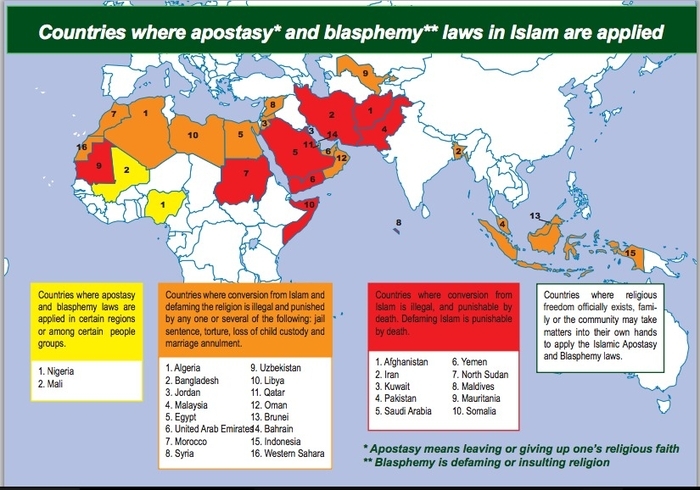 Sep. 4, 2013 update: Here's a useful map outlining the apostasy and blasphemy laws in Muslim-majority countries, produced by Set My People Free, a Christian organization.